The boys went back to school today after a week off for Spring Break. I suspect they are looking forward to the rest, as the last 10 days have been very busy!! We had our first house guests come from Vancouver. They reported the guest bed was very comfortable in case that is a deciding factor for anyone planning a trip this way. 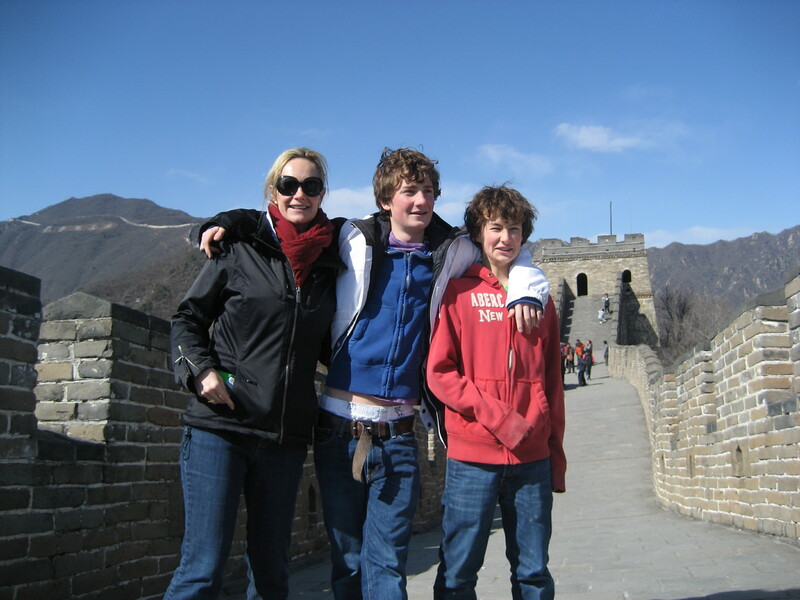 We spent a fun day out at the Mutianyu section of the Great Wall. (Photo attached!) It is not my favorite part of the wall as it is so commercial. There is a subway sandwich shop at the gate. But the boys loved it. Here, you take a chair lift up to the wall, as opposed to the more remote sections where you have to walk up to it. The wall itself at this section has been quite renovated, which makes it much easier to walk along, but you feel more like a tourist and less like an explorer. Still, it is very impressive and you cannot help but be awed by the scope of it. At 8800 km long it really deserves to be called one of the world wonders, even if you can’t really see it from the moon! The best part of the wall for my kids… the luge ride you take back to the parking lot! They were incredibly proud of being reprimanded for going too fast (a problem their mother did not have, seems the more you weigh the slower you go). They went up and did it a second time! I did not. We were then off to Hong Kong for 5 days. We had to come to get our new Visas, which we did. So now we are legally back in Beijing for another 30 days. We love Hong Kong. It has been a home away from home for us since our trip around the world in 2005 when we used it as a base. We came back to our same rooms at the wonderful Peninsula Hotel where I was greeted with “Welcome Home Mrs. Vogel”. Made me soooo happy!! We had a great time visiting all our old favorite restaurants and shops. Ate so much we are all feeling a little swollen now! 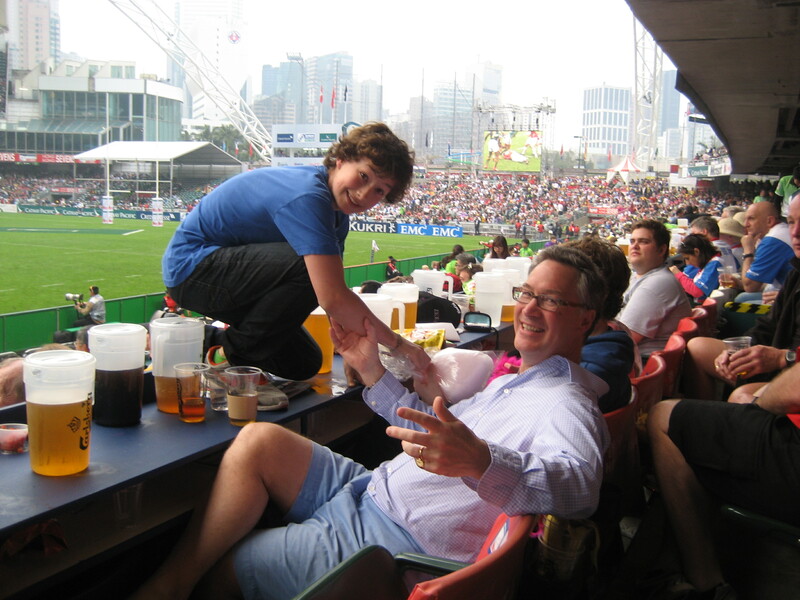 It was also the weekend of the Hong Kong Sevens Rugby tournament. It is a blast. Three days of 24 teams completing for various prizes. It is called the sevens because seven players for each team play for 7-minute halves (except in the finals when the halves are 10 minutes). It is quick and fun to watch, even if you know nothing about Rugby. She says, speaking from experience. Fans dress up in wild costumes, tons of booze is consumed and a great time is had by all! By the end of day three everyone is exhausted, players and spectators alike. 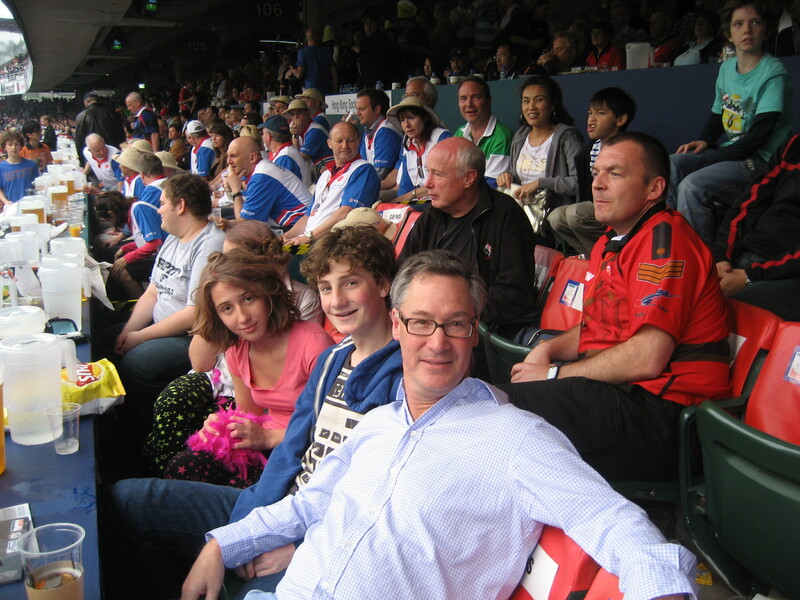 For us it was doubly fun as we were able to see so many friends… all our old Hong Kong buddies were there, a bunch of people came from Vancouver, including John’s grade 12 rugby coach, and our neighbor from Bristol Gardens in London! We are planning to go again next year… maybe I can convince the boys to go in fancy dress!! In 2012 it takes place March 23 – 25, hopefully everyone will check their calendars and consider coming!